BUSHWICK – Radio Free Brooklyn went live in the basement of a bike shop in Bushwick with four microphones and a mixer over three years ago. An internet radio station was another step for co-founders, Tom Tenney and Rob Prichard, in making space for creativity to fit the times. Radio Free Brooklyn was cobbled together with whatever the founders had or could get free or very cheap. Over 100 shows were produced in a studio that seemed more like a derelict closet, dimly lit and graffitied. In the early days, they were eager to fill 24/7 worth of airtime. Shows were created in-the-moment like a half hour late-night reading series of children stories read by a burlesque dancer. When they started, Tenney said they put every show they could on air, a show called Talking Paper broadcasted interviews with people who created with paper. They even had a live karaoke show with studio guests and callers, Empty Orchestra. Then, the rent and space were more than they could manage. 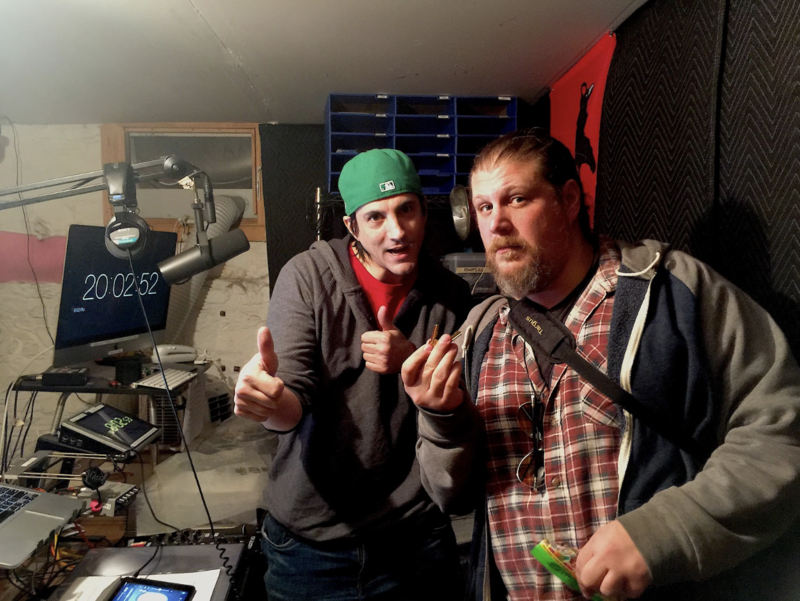 Late last year, Radio Free Brooklyn found a shiny new studio on the other side of Bushwick. They had more people wanting to get on air than open slots. The radio station transformed from being managed by a group of friends to forming a board of directors. 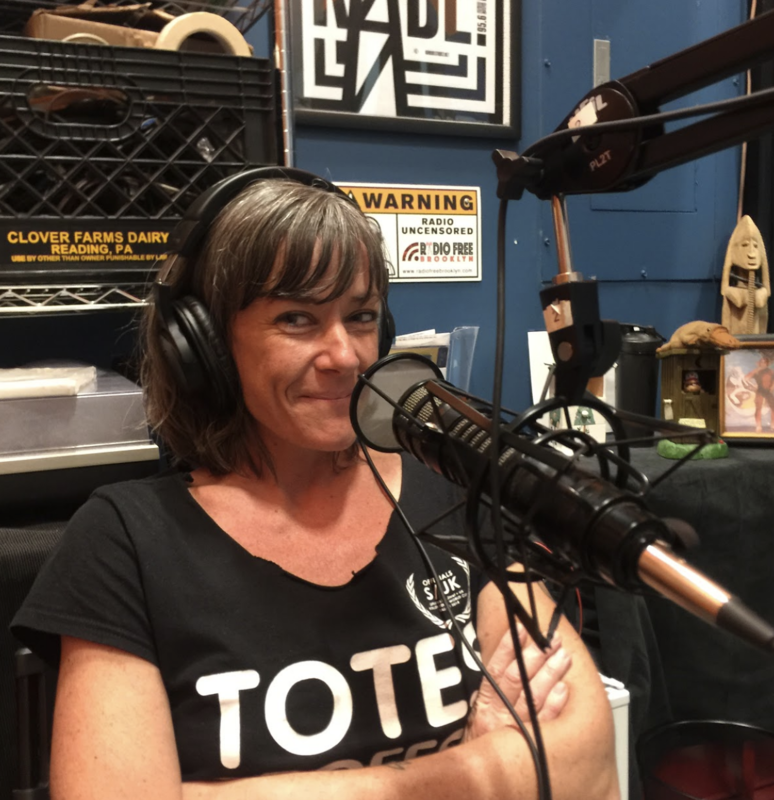 With a flood of new radio show applications, Tenney and Prichard began curating the shows based on creative gaps in their programming with shows that were topical and local. They balanced an even split with music and talk. Their mission changed from featuring creative self-expression to including community self-expression. “We are hyper-local with global reach,” said Prichard. “We are here for the average Brooklyn Joe and Josephine in that we are reflecting an eclectic community sonically back at every day folks who are interested in their fellow Brooklynites. The most popular shows appeal to a niche audience or subject matter like Teens Take the Mic, hosted and produced by teenagers for a teen audience, featuring local teen musicians. Fem Chords, another popular show, interviewed women and non-gender conforming people in the music industry. The shows mostly to get on air amplify the voices of underserved communities of Brooklyn like the Haitian American community who want to use radio as a conductor to reach their community and beyond. In their small blue and orange fishbowl studio, cultural and musical communities share the mic. 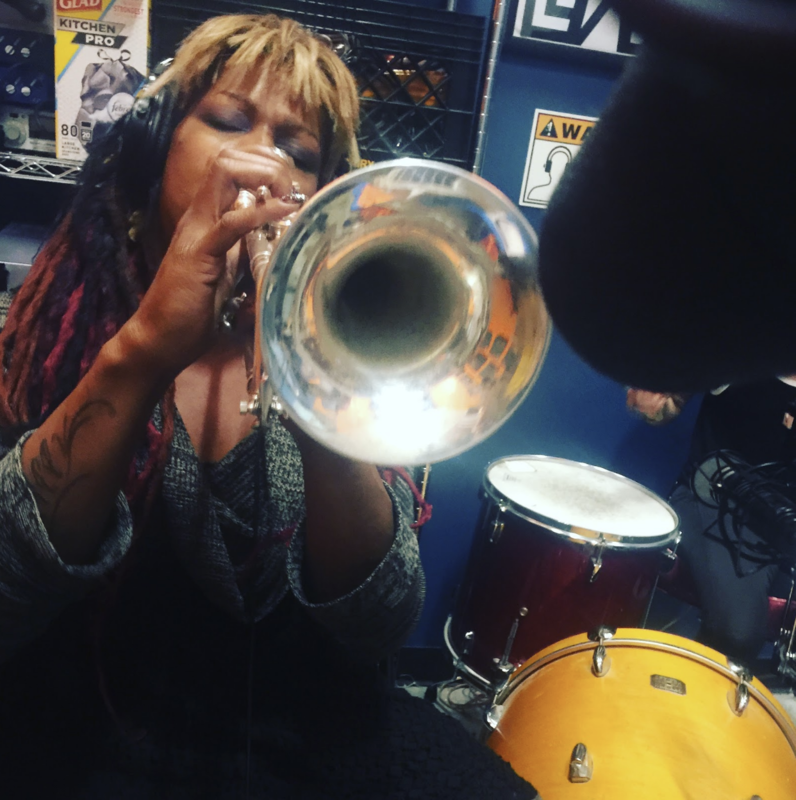 Brooklyn Bandstand, a Radio Free Brooklyn standard, is live every weekday at 4 p.m. and features local Brooklyn musicians. Queer State of Mind on Saturday mornings is a talk show hosted and produced by queer people of color. Education is a very important part of Radio Free Brooklyn for Tenney and Prichard who envision the station as a media university of the streets at time in our culture when it is critical. A teen educational outreach program has grown out of Teens Take the Mic that trains high school students to analyze, understand and make media. After a couple of months of training, students create their own radio shows that will be aired on a designated teen stream. Discovery is an intimate aspect of live radio. When listeners tune into a podcast, they’re done unless they subscribe to another. Tenney believes radio offers a live flow of experience. When one show ends, another one begins, allowing listeners to discover many diverse voices, stories and music. Listeners have grown from 300 a month to nearly 15,000. In retrospect, Tenney and Prichard are not surprised at how fast it’s grown. They believe the station provides something really valuable and unique regardless that most people rely on Spotify and podcasts. There’s still an appetite for live content. Tenney and Prichard said the plan for Radio Free Brooklyn is to keep going however they can. 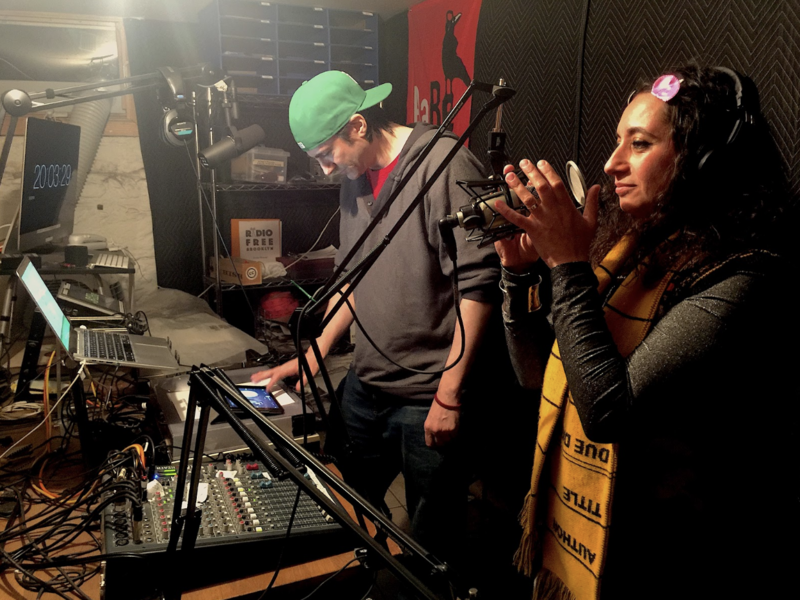 With grants, offering podcast boot-camps and recording studio clients, they still scramble daily to keep the station oscillating on the air waves and keep the volume up on all of Brooklyn’s sounds. Even as the volunteers multiply at the monthly media mixer, new show proposals wait for slots, and locals musicians overwhelm the station with a flood of Brooklyn music, they are still searching for a way to sustainably grow, create and pay the rent. Curious for more? Listen to our Q&A with Radio Free Brooklyn founders, Tom Tenney and Rob Prichard (transcript below), and please do support their work with a buck or two while you are at it. Bklyner: How does Radio Free Brooklyn choose its line up? Tenney: We have actually changed the way we choose our lineup. When we first started in the basement three years ago it was essentially…you want to do a show? You got a show. Just make sure it’s not hate speech and in the bounds of normal human decency. Now we are little bit more selective. We choose our shows currently on uniqueness. If there’s not something else like it on the station it will have a better chance of being accepted to the lineup. And also, we’re really looking for topical local content. Now that we have people coming to us instead of us reaching out to people asking do you want to do a show. We are able to be a bit more curatorial. And we are able to shape the station in a way that we would like to see it grow. Prichard: It’s also done by committee. And it was something that Tom and I and maybe someone else just would go through it. Now we have a management team. Either “up” votes or “down” votes. And we don’t overrule them. The majority says no then the show doesn’t go on. Bklyner: What are the shows that tend to get approval? Prichard: Topical local stuff that we don’t have. If we see a need, if we don’t have a cooking show for instance or we don’t have a dating show. That can fit in the schedule. Lots of times people want 8 to 10 Monday through Friday. Sorry, we don’t have that. Tenney: And also, to add to that as a nonprofit as part of our mission we have dedicated ourselves to amplifying the voices of underserved communities. Particularly in the Brooklyn area. If we have an underserved community we have identified, and they come to us, chances are good that we will find a way to have you on the air. Bklyner: What are the most popular shows currently? Prichard: I went to the leaderboards and I looked at three weeks in a row and what I saw was that constantly coming out with SHE in the Morning, A New Latin World, Ben Talks, Mondo Jazz, Mood Indigo, Cosmic Debris, Point of Order and Teens Take the Mic. Tenney: And I would add that we are not primarily a music show station. We are not primarily a talk station. We are pretty much equal with both. And that’s reflected on what shows do well each week. Some of our talk shows that do really well like She in the Morning broadcasts at 8 a.m. every Thursday does tremendously well. And I would say that the music shows that do well are ones that tend to cater to a niche audience or a niche subject matter like Teens Take the Mic was the top show last week. That is a show that that caters very specifically to teens. Its produced and hosted by teenagers. Prichard: A New Latin World, it’s niche. It’s Latin music. And Mondo Jazz is constantly up there because he promotes like a fiend. Tenney: And it’s also a really good jazz show and he promotes it to the jazz community who are really hungry for that kind of content. Prichard: It’s actually a niche jazz show. It’s not American jazz. It’s every other kind of jazz. Not American, so you’re not going to hear the standards. You’re going to hear stuff you’ve never heard before. Tenney: Exactly, so Mondo Jazz meaning world jazz his original name for the show was Jazz with an Accent. Bklyner: How has the audience grown? Prichard: We got a big spike after the London Telegraph profiled us in their article on the best internet radio stations in the world. And I know Tom has a theory that whenever a lot of stickering happens that maybe we get a little bit of a spike. I tend to agree with that and I think we should do more stickering. Tenney: But normally it’s about anywhere between 8 and 15 thousand listeners a month. I would say an average of about 10 (thousand). Bklyner: Has the growth of this station over this short period of time taken you by surprise? Tenney: Not really. Honestly, because I think we provide something that is really valuable and that is unique. I think with the disappearance of both local news and local content on the radio and also with the disappearance of live content. People are sort of more hooked into time-shifting and Spotify and that kind of thing. I think that there is still an appetite for live content and that’s what we focus on. We’re not a podcast network. We are a live broadcast network. And I think that is attractive to both listeners and hosts. Prichard: I’m going to push back a little bit and in retrospect, I agree no it’s not surprising because of what he just said but as it was happening we were surprised. Tenney: Yeah, I will go along with that. In retrospect it makes sense but at the time we were kind of like you know it started growing immediately and faster that I think either Rob or I were ready for to grow. Prichard: It was a challenge. Tenney: I mean used to have this recurring dream where I was chasing a bus and the bus would like pull over to the stop and I would be almost on it then it would pull away. Then I would keep chasing it and I’m sure that this was related to Radio Free Brooklyn because that is exactly how I feel about it. It’s like I am trying to catch up with it always. I’m trying to get on that bus and I can never never never quite make it. But the good part of that is the bus is constantly going forward. Prichard: So, there were some hairy months there. And So, we weren’t prepared for that emotionally or just psychologically. It was a surprise. It was a shock. Tenney: But at the same time, I mean I think that amount of work is what it takes. And also this is why a lot of people don’t do it because. People start a radio station and they’ll be like, oh it won’t be that expensive, oh it won’t be that much work you know, and then they realize very quickly that it is and many people don’t have the time or the inclination to put that much you know extra work into their lives. Bklyner: What exactly did it entail to put this radio station together? Prichard: A lot of coding. Prichard: When you go from 17 shows a month to 30, all of sudden your work doubles. And when they drop out you have to do it all over again. And we had some drop out and also just because of growing pains. People think it’s going to be fun to produce a radio show and then two week later they find out it is not so much fun for them. Tenney: And I think also this speaks to our general growth and where we are now because you start with a small amount of people. People come in and they leave as Rob was mentioning because they find that it is too much work. But then a certain smaller percentage sometimes stay because they love it, and this is what they always wanted to do. The longer you go on the more people kind of stick to that and so that core group that are really super devoted to it grows and grows and grows and there becomes less room for those other people. Of course, we have people who come on and oh this isn’t for me after two or three months. That’s fine. But we have also changed the way we onboard. We have people come to our media mixers at the beginning of the month to just sort of meet everybody and understand what we do and what’s involved. It used to be that we would onboard people sometimes without ever having laid eyes on them. That has changed and that has also increased the quality of the kind of hosts that come through our doors right now. Prichard: We didn’t know how to manage expectations well in the beginning. The people came expecting that they were paying dues, so this was a service. We had to think through our process and think about exactly what are we as a community. We are not a service. We are a community. This money doesn’t represent fee for service. This money actually represents your contribution to keeping the whole boat afloat as opposed to we’re going to do things together. Tenney: Exactly. It was as if we all shared a car and we were asking for gas money. Asking for gas money does not make me your cab driver. Bklyner: What other local radio stations are there in Brooklyn and how does Radio Free Brooklyn fit into the mix? Prichard: It was like Tom was saying. Most of the other stations are actually not 24-7 and they’re not really live event destinations. They’re podcast networks. You can go there and listen to what they recorded last week or yesterday. Tenney: Yeah, there are live ones also and there are good ones. KPISSdown in punk alley which there is a new host starting today who also has a show on KPISS and I think that is great. And they operate out of a shipping container. I think they’re like us. They broadcast live most of the day and they do pre-records. They’re exactly what they want to be which is sort of a small operation with a tiny studio that everyone has to work off of Spotify and we wanted to be something. We wanted to be a nonprofit. We wanted to be an organization that has a radio station but mainly does good work in the community, whether that’s art. Whether that is education which is something really important to me personally. There’s also a station called Newtown Radiowhich is very good. There’s the Lotwhich mainly caters to DJ culture. We’re really about bringing program that is relevant to the community out into the community as opposed to just DJs playing music. Tenney: And I would be remiss if I didn’t also mention that Rob and I did a show on BBOX Radio. They currently broadcast out of DUMBO. And they’re out of all these local radio stations we’re mentioning kind of the closest to what we do in terms of programming. Prichard: They have a lot of niche talk shows. Tenney: I loved doing the show on there. But then a year or two later we’re talking about how to get something up and running, an internet radio station was one of the first things that came to mind partially because we had done that. Bklyner: I know before you started the internet radio station, you had performance spaces, and you had mentioned that this was the next step in doing the same thing, but without actually having the large physical space for performance. Tenney: I don’t know if it was the next step as opposed to another step that better fits the times. When he and I talked about it back when he and I were producing stuff in Manhattan, real estate was relatively cheap in certain neighborhoods. And you could get a storefront or a loft like Rob had up and running for not that much money. That’s kind of unheard of in Manhattan at this point. Prichard: It’s actually almost unheard of in Brooklyn. Also, the mission in itself has changed. For instance, my theatre space, Surf Reality, was a place I marketed to artists and producers and content providers. And Radio Free Brooklyn we’re actually marketing that to Brooklynites and the world. That’s a different mission. Then Surf Reality, most of the producers that came in they were one and done. Or maybe a few and done. We had an open mic that was regular. There were a few notable exceptions like a show that Tom had produced and directed called Grindhouse that lasted a couple of years every Saturday night. But for the most part it was just a few nights or one night and done. Here at radio free Brooklyn we have shows that have been with us for three years, since the beginning. Most of them are here for at least six months. A lot more bang for the buck. Tenney: And the reach is broader. Bklyner: What are Radio Free Brooklyn’s plans? Tenney: Just keep going, however, we can. Prichard: More grants. One of the hot topics on what to do in a community that is artistically and community oriented. One of the first concerns was we didn’t want to be a wedge. We didn’t want to be an agent for gentrification. We wanted to be the opposite. We wanted to be glue. We wanted to be a reason that the community stays together. And to be a tool for the community to stay together. There’s that. Tenney: The programming we are starting to focus on like the underserved communities in Brooklyn are a reflection of that. That we want to be a way to kind of bring these communities together both sort of intra-communities. We are planning on potentially doing something with the Haitian American community in Brooklyn. As a way to sort of foster communication and expression within that community, but also from that community out to a larger audience both Brooklyn and beyond Brooklyn. That is really of utmost importance to us right now. And we have a teen program. We just got a $10,000 grant from the Rockefeller Brothers Fund for starting a teen program which we will be launching in 2019 called Teens Take the Mic, a name that is borrowed from the radio show with the teenagers I mentioned earlier and potentially that may happen in DUMBO or happen closer here to Bushwick. But the idea is to be able to create media literacy in teens through active learning through teaching them how to understand analyze and make media. We’re going to do a few 6-8 weeks programs with about 10 students each with the goal at the for them to have created their own radio shows. Prichard: Which in turn, the batch of those shows will be a teen radio network. Bklyner: Now, in the beginning you had the station run by you and your friends. Now, you have all this team of hosts and who have come into the circle. How has that transformed the station and how has it changed it? Prichard: It happened that way out of necessity. It became too big to manage. We had to bring people in to manage themselves. And again, we are not fee for service. We had to figure out how to self-organize this. Tenney: Also, just having other people. Rob and I both have similar backgrounds. We both came out of punk rock and moved to New York City to do these underground performances. But bringing other people from our community and to the management team and offering an opportunity for them to have some agency in creating what Radio Free Brooklyn is, it become a richer organization because we can draw on their experiences and their expertise as well. Prichard: Then the whole thing because we kept growing and growing and growing, we need more and more support, so we took the whole thing not for profit, the 501C3. Now we have a board of directors that gives us guidance on and governance and that let’s management focus on management. Tenney: The board of directors is pretty new and actually I am pleasantly surprised at how helpful they have been already, even just the first few months. And they have come up with some great ideas. And they have helped us out with the grant writing and that sort of thing. Prichard: Once you become a 501C3, you have to have that board. Well are they going to be kind of an appendix where you have it and it’s there and not doing anything or is it an actually functioning organ. So far it looks like it’s serving some function. Bklyner: We are now in the new studio, fairly new studio, of Radio Free Brooklyn. 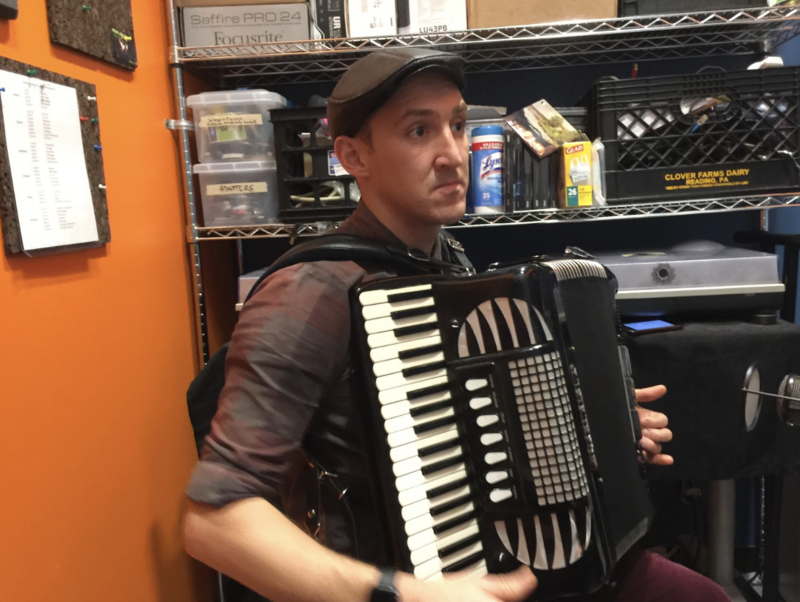 Why did you move to a new studio? Prichard: We couldn’t afford the old one without subletting out some of the space and that proved to be problematic the one time we did it. It was also cold in the winter, hot in the summer, pretty dusty, smelled bad. Prichard: It was the ghetto. Now we are in Silicon Valley so to speak. Tenney: Honestly, while we were perfectly functional while we were there. A) the hosts were not as happy as they are here and that makes a huge difference for us. I can feel that difference in the satisfaction of the people who are hosting shows. But also, when we bring people who don’t know Radio Free Brooklyn whether they are clients, we do some recordings here for clients to make a little extra bread. It gives much much greater legitimacy than we had in that basement studio where you had to walk down into that basement and hold your nose. Tenney: It was also in the basement of a residential building. We didn’t have too many problems with neighbors, but we did have some. And this we don’t have any issues here other than bathroom being right across from us. 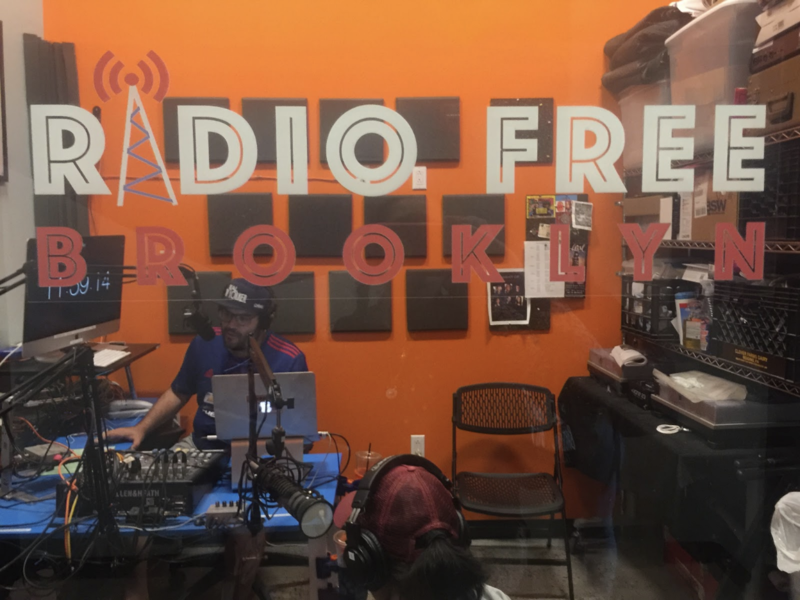 Bklyner: What is the mission of Radio Free Brooklyn and how do we measure its impact? Tenney: The mission is for us to provide a global platform for people in our community and for people in the greater Brooklyn community and undeserved communities specifically is what we are focusing on now. We also have three pillars of our mission and they are community, discovery and education. Discovery has to do with the live aspects for the radio where people are tuning in as opposed to podcasts networks where you just listen to a podcast and then you’re done unless you subscribe to another one. This one gives you that live flow experience which is traditional in live radio and television where you are listening to the radio. I’m not listening to this specific podcast. And so, when one show is over another one begins and that may grab your interest and you may suddenly find yourself listening to a number of different shows that you did not know about. And the education part is what I was talking about in terms of these after school programs and promoting media literacy and media education which in this juncture in our culture is more critical than ever. Prichard: Objection to the Rule, excuse me, which we do on Sundays and has to do with local and national and international issues and how they meet. So that’s how we measure the impact is by the fact that people are going yeah that’s great please do more and can I be on. Another thing is we have much more demand than we have supply for shows. So that is a way of measuring the impact. More people want to get on than we can give them slots. More people want to record their podcasts here than we have time to give them. More people are volunteering than we have the ability to onboard. Tenney: And I don’t know of any other radio show that zooms in that closely on one specific dilemma. Tenney: There are shows that focus on women. We have had a lot of those actually that have come and gone. There’s been Fem Chord. There has been the Womanity Project. We now have a new punk show actually that’s focusing on riot girls. It’s influenced by the riot girls and it’s focusing on women and nongender conforming people on the punk rock scene. It’s those kind of things. Prichard: The music show I produce every Wednesday night at midnight is heavily into the Brooklyn underground music scene and contract and compare it with the global underground scene. You get to see how well we stand up to the world and I think we do pretty well. Bklyner: You mentioned that you saw Radio Free Brooklyn as the media university of the streets. Can you expand on that? Tenney: Well, we sort have been. For instance, Tom just said to do a show here you don’t have to be media literate because we will train you. The proof is in the pudding. We got 60 shows on air right now and every one of them is the result of having been trained. We’ve done some live event broadcasting which we want to expand on that and get more people trained in doing that. Teen Take the Mic is an educational outreach that now has been supported by a $10,000 grant. Tenney: We also have something called podcast boot camps that have been on the back burner for a very long time but I am hoping we can get them up and running by November of this year and they are weekend intensive workshops on essentially how to do your own podcast from soup to nuts, from everything from how to buy a microphone, what kind of mic should I buy, how do I set it up with a computer, how do I set up a studio, what is the marketing side of this, how do I distribute, interviewing techniques, all these kinds of things and that fits sort of neatly into our education pillar. Prichard: The arts of conversation, the journalism, the ethics in media, how to present a storyline with pith and efficiency and ethically. Thank you for listening to an audio Bklyner piece with Tom Tenney and Rob Prichard, founders of Radio Free Brooklyn. Thank you.